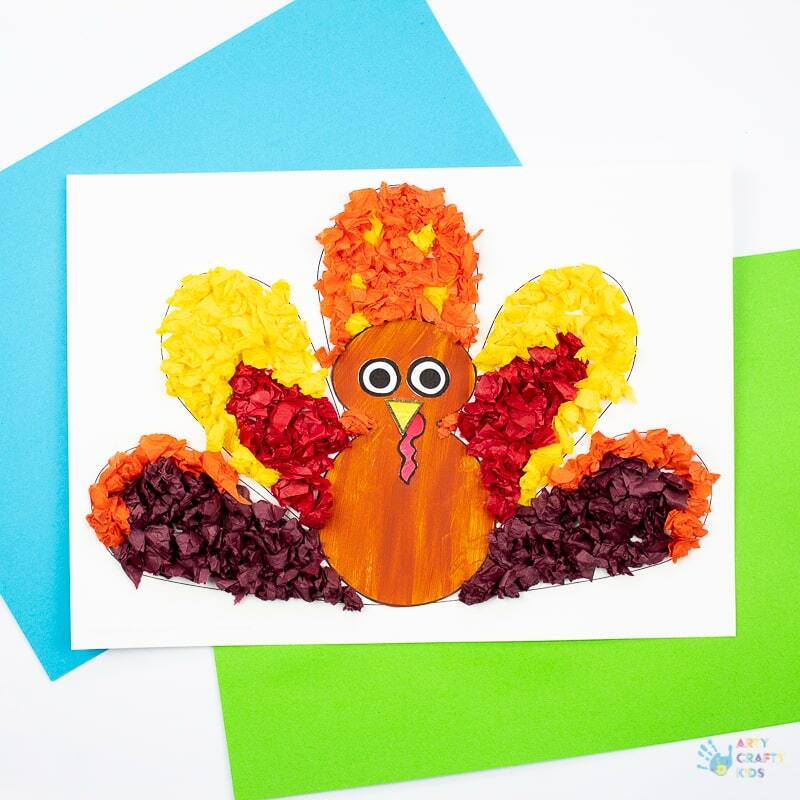 Today I have the pleasure of publishing one of three brand new Thanksgiving Turkey Crafts – Tissue Paper Turkey Craft! 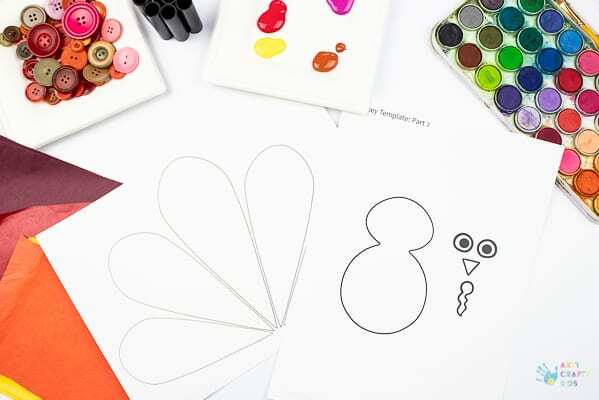 Using our free turkey template, your Arty Crafty Kids can decorate their turkeys in a variety of fun and dynamic ways; exploring printing techniques to play with geometrics, adding tissue paper to work those fine motor skills or buttons for texture and body! They could also combine all three methods to create one fabulous turkey! 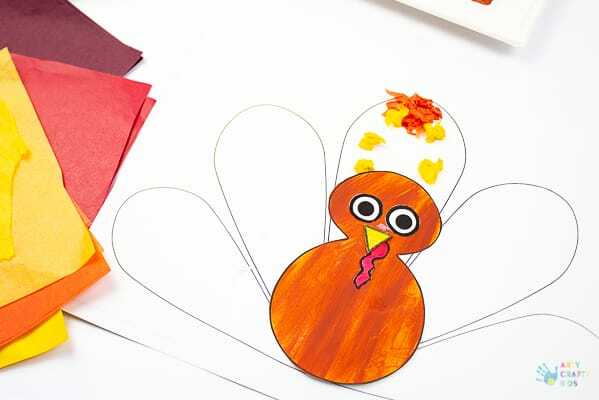 This version of our Turkey series focusses entirely on fine motor skills. The process of tearing, scrunching, rolling and sticking is a wonderful exercise for strengthening the muscles within the hand and developing hand-eye coordination. To extend the project further, children can work on creating patterns and consider symmetry within the creative process. 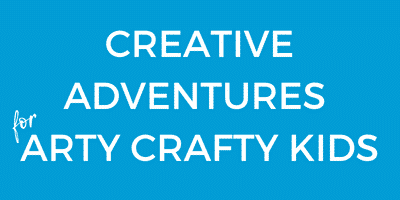 Sign-up to our newsletter and we’ll send the templates over! The form can be found towards the end of this post. activity booklets and much more! Step 1: Download the templates from the member’s area or via the sign-up form found towards the end of this post. Print the templates on to white cardstock and gather the materials. Remember to check your printer settings. Some printers require adjustments for different types of paper and card. Step 2: Paint the turkey body and facial elements (Turkey Template Part 2) and then cut out the turkey body elements and assemble to form a face. Glue the completed body to the centre of the painted feathers. Step 2: Tear, scrunch, roll and stick the tissue paper onto the surrounding turkey feathers. Older children may prefer creating small, tight and compact balls of tissue paper and younger children will go for big, lose and spaced out- both are perfect! Painting the feathers first may help younger children and they also can match the tissue paper to the correct feather colours. Step 3: Fill the turkey with tissue paper until the feathers are complete. To extend the project further, introduce the concept of symmetry and encourage your Arty Crafty Kids to create patterns within the feathers using tissue paper. 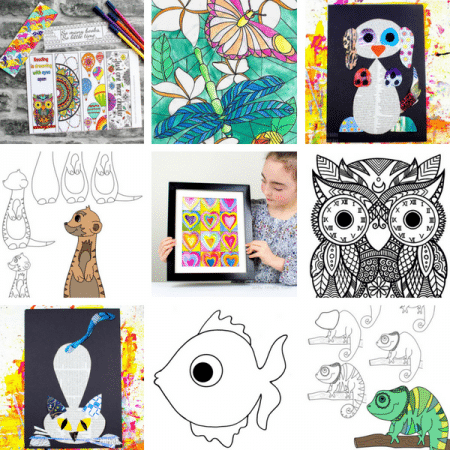 To access the template, sign up to our Arty Crafty Kids Club newsletter and get art & craft, club membership and Arty Crafty Box updates! 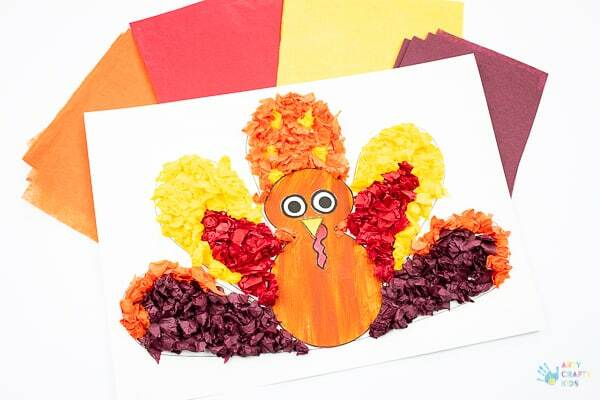 hope your Arty Crafty Kids enjoy playing with tissue paper to create beautiful feathers for their turkeys! 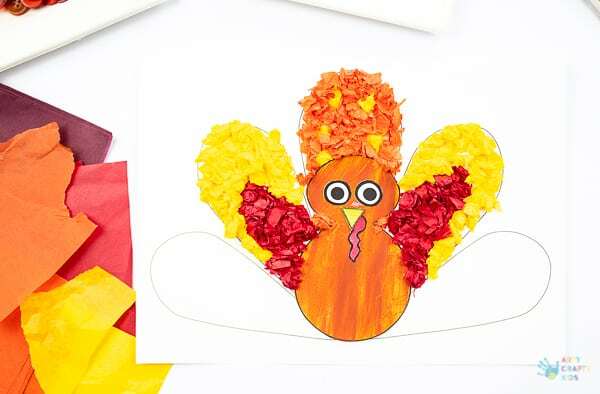 This Tissue Paper Turkey Craft is one of three new Thanksgiving Turkey crafts featured on Arty Crafty Kids. 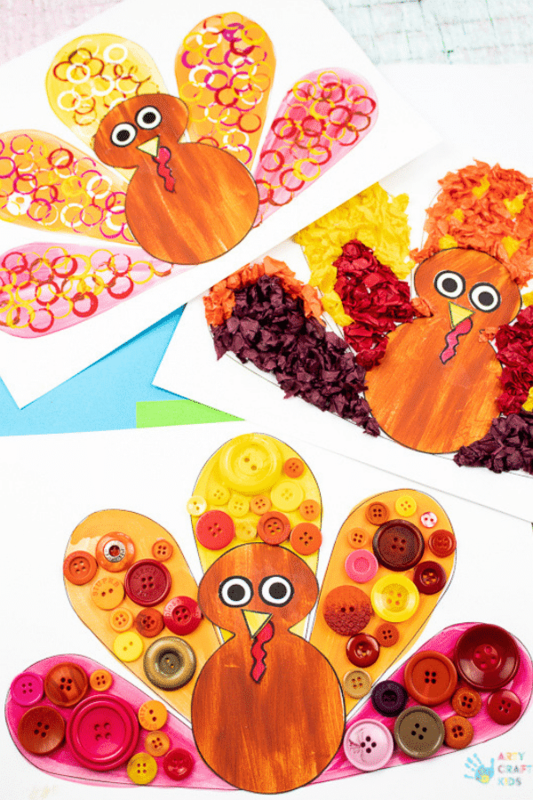 Using the same Turkey Template, your Arty Crafty Kids can also make a Circle Print Turkey or /and Button Turkey! Perhaps they can make an entirely new turkey using difficult mediums and painting techniques!